Gov.-elect Janet Mills speaks to reporters Wednesday, Nov. 7, 2018, in Portland, Maine. Mills will be the state's first woman governor. 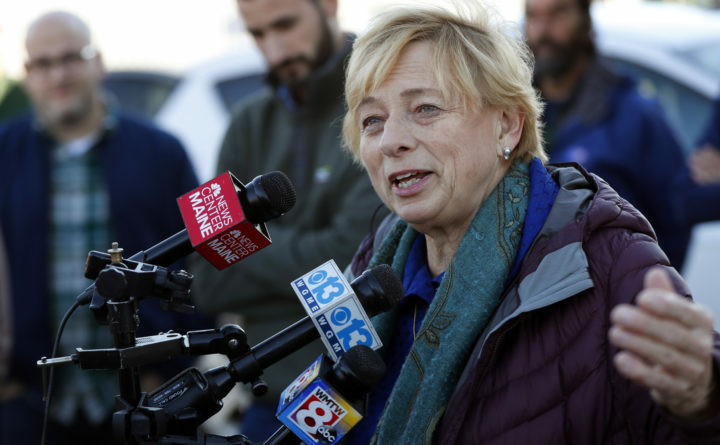 PORTLAND, Maine — Democrat Janet Mills said Wednesday that her top priorities as Maine’s next governor will be expanding Medicaid as voters demanded in 2017, lowering health insurance premiums and tackling the opioid crisis that has claimed hundreds of lives. Just hours after claiming victory over Republican businessman Shawn Moody and independent state treasurer Terry Hayes, Mills paid a visit to a waterfront diner where she shook voters’ hands and thanked them for their support. Fulfilling her priorities will be easier, she said, because Democrats won control of the Maine Senate and widened their majority in the House. It’ll be the first time since 2010, when Republican Gov. Paul LePage was elected to his first term, that one party has control of both the Blaine House and the Statehouse. She said a Democratic-controlled Legislature will help her accomplish her goals of making progress on health care and climate change. “These are not necessarily partisan issues,” she told reporters before having breakfast. Mills, who is currently Maine’s attorney general, will become the first woman to serve as governor in January when she’s sworn into office. Asked about the milestone, Mills replied, “I like to think I’m the most qualified person for the job, first and foremost.” She added that she wants girls to know they can achieve any goal. In her victory speech, Mills pledged to usher in an era of “open doors” and collaboration in state government. She also vowed to change the tone after eight years of LePage’s combative style, and to fight Trump administration policies on environmental, immigration and welfare. Doris Santoro, a Bowdoin College professor, told the governor-elect she was excited to tell her daughter the state will have a female governor. The gubernatorial race resulted in an advertising blitz, and liberal out-of-state groups outspent Republicans on attack ads on behalf of Mills. Mills spent roughly $3 million and outside groups spent at least $7.7 million to boost her, while total spending for Moody’s campaign was $5.8 million, according to the campaign finance reports. The entire field of candidates agreed the firebrand LePage steadied finances in an aging, rural, economically stagnant state. The new governor will face key decisions on the future of Medicaid expansion and marijuana retail sales, which have been delayed since voters approved them in 2017 and 2016, respectively. Mills said she’d reverse LePage-era cutbacks to public food assistance. She said she’ll quickly implement voter-approved Medicaid expansion that the governor has held up in court over his fiscal concerns. Mills has called for more grants and loans to spur broadband projects and encourage Mainers to return to the state and work remotely. She also lambasted the governor for pulling out of off-shore wind projects. In the campaign, Mills fought off attacks from LePage, who has lodged unsuccessful and ongoing lawsuits claiming she abused her power while serving as attorney general. She said she’s fought for Maine’s residents as an independent constitutional officer with the legal authority to determine what’s in the state’s public interest. She said Wednesday that LePage has hampered her efforts by preventing her office from filling vacancies and stopped the flow of budgeted state funding to her office for legal services provided to state agencies. The governor, meanwhile, has pledged to keep working up until his last day in office. The voting came against a backdrop of Democratic anger over the election of President Donald Trump. Democratic enthusiasm was underscored by a large advantage over Republicans in the number of absentee ballots.